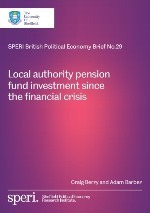 A new report published today by SPERI presents evidence and analysis on asset allocations by local authority pension funds in the UK. In this new SPERI British Political Economy Brief, Craig Berry and Adam Barber chart the changes in investment patterns by local authority pension funds since the 2007/08 financial crisis, and the extent of moves towards ‘alternative’ investments such as infrastructure. The report demonstrates that since the financial crisis local authority pension funds have de-equitised to some extent, but not moved into bonds, and appear more willing to invest in alternative assets. The largest funds in particular have demonstrated an interest in infrastructure investments. The analysis in this new report will shortly be supplemented by a further SPERI Brief which will assess the strategic decision-making of local authority pension funds.